rodeo - Horse Motels International. Worldwide horse motel directory for the traveling equestrian. We find horse motels, horse hotels, overnight stabling, overnight boarding, horse hostels, ranches, bed and breakfasts, horses, and more. Facilities: Four 12' x 12' covered pens with 12' x 15' open run areas, five 30' x 40' semi-covered pens, eight 20' x 20' steel pipe pens with 3 sided shelters, and five 15' x 30' semi-covered pens (all are well lit and secure). Camping in RVs and/or trailers with living quarters and picnic space available. Fishing also available (catfish & bass tanks). Plenty of room to ride and exercise your horse(s). Health certificates and negative Coggins must accompany each horse. Discounts with multiple horses!!! Location: Exit off I- 20 at 283b then go north 1/2 mile to first exit, Old Anson Rd or 2404. Go west on 2404, from second stop sign, 2.3 miles then go left up a paved driveway 1/2 mile. We are 3 miles from several motels and restaurants. Facilities: Stalls with runs, large box stalls, or summer panel stalls available. Large trailer parking, some RV plug-ins. Covered arena, round pen, exercise track, wash rack available. Barrels, trail course, cross country course, dressage arenas and stadium jumps also available. 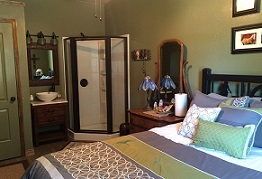 $25 per night.br> Location: 10 minutes away from Abilene State Park equestrian riding trails. Facilities: 16 open air covered stalls, horse wash area, large parking lot for easy trailer access, full service RV resort with full hookups at each site – all 50/30 amp. City sewer/water, 40 HD cable channels, free WiFi, convenience store, clubhouse, coin-op laundry rooms, private bathrooms, outdoor pool, playground, fenced-in (off leash) dog area, dog wash station and resort games. See map for directions or call. Location: Traveling east, Exit 286C off of I-20, stay on the access road, the park entrance is located 1/4 mile after the stop sign. Traveling west, Exit 286C off of I-20, stay on the access road until you reach the the overpass, turn left, then left again, travel east on I-20 access the road for 1/4 mile. Facilities: Horse motel for your horses overnight stay. Clean stalls with shavings / trailer parking / and clean restroom with shower in the barn / hotels and restaurants in Decatur Texas / 40 minutes from Will Rogers Coliseum!! Location: Five miles north of 380 and 287 intersection in Decatur, Texas. Facilities: Beautiful enclosed barn with (33) 10’ x 12’ stalls. All have auto waterers and feed bunks. Bedding & Hay can be purchased on site. Tractor trailers will love turning around in our huge parking lot. RV Hookups available. Outdoor arena for exercising horses. Closed circuit cameras, owners live on premises. We are ¼ mile off the road, can you say QUIET!!! Current Coggins required on all horses. Location: Exit #77 (Pullman Rd-FM 1258) from 1-40, go south 9 miles. Arena is on the right side of the road. (West). Facilities: 23 Indoor box stalls, runs, outside pens. We have a new large ground asphalt parking area with electric and water for campers. Guest rooms are also available. Location: Easy access from I-40. Click on "Location on Google Maps" above for a map to our place. Facilities: NEW BARN--we offer 12' x 12' stalls w/bedding. We also have outdoor pens available. 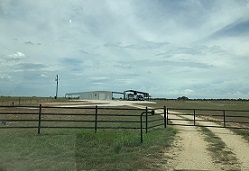 Our facility is completely enclosed with a 7' chainlink fence and automatic front gate that makes access to the property controlled. Plenty of room to park trailers. Feed to be provided by boarders. Owners live on premises. A continental breakfast is provided for motel guests. You must have a current health certificate upon entering this facility. Location: Easy access from I-40 and/or US Hwy 287 (Dallas/Ft.Worth Highway) From I-40 westbound take Exit 87, turn south for 3 1/2 miles. From I-40 eastbound, take exit 78. This puts you on US 287. Go 8.7 miles to County Road #5. Turn right at this intersection. We are located on the southeast corner. Facilities: Indoor box stalls in our insulated barn and partial covered turnouts, and large turnouts. We have the ability to board 1 horse to 60 horses. We provide shavings for indoor stalls and have the ability to provide most feed and hay (alfalfa and coastal Bermuda) with advance notice. We can accommodate large rigs and have a drive that’s easy to get in and out of. 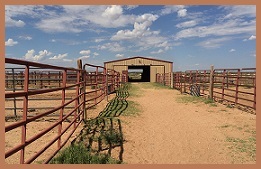 We have a large round pen, arena, and 3 acre pasture to work your horses. Location: Conveniently located about 3 miles off I-27. 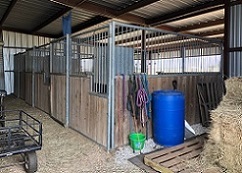 Facilities: Box stalls, covered stalls with runs, open pens, round pen, and an arena. We have a large parking area for safe an easy loading. Easy access from the highway. Current Coggins test required. Customer supplys their on water buckets. Next to Green Chili Wille’s, Steaks and Burgers. Meal discount to horse motel renters. Competitive prices; cash or credit card—no checks. Location: Exit I-27 on McCormick Road. - On the east side of Interstate. Facilities: Safe, 12' x 12' matted stalls in an airy shed row, MD barn, or large pipe-fenced paddocks with 12' x 12' loafing shed or 1 acre pasture. Hay and bedding available upon request. Owners live on the premises. You are welcome to spend the night with your rig, dogs and livestock. We have easy turn around for big rigs with 50 and 30 amp hookup and water for trailers. A dump station is available at the RV Park up the road. If you want to drop your trailer, no problem. Completely fenced and gated for security. 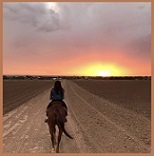 There are numerous equine events in Amarillo during the year, with Palo Duro Canyon State Park and AQHA within an easy drive to the property. Top notch equine veterinary and farrier services are available if needed. 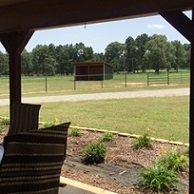 Paddock with run in shed or pasture is $25/horse with $10 each additional horse per night. Stall rates are $35/horse and current negative coggins is required. Location: Windy Hill Farm is conveniently located on the west side of Amarillo with easy access to I-40, numerous hotels, the medical center and restaurants. Facilities: 20 miles east of Austin, 10 miles west of Bastrop, just 4 miles north of Hwy. 71. Nearby access to 16 miles of fabulous scenery and mostly dirt trails along the Colorado River at McKinney Roughs Equestrian Park. . . . 3 - 5 rig spaces in a woods setting with gravel driveway, electric and water, fire pits and picnic tables. Big Rig Friendly! ( up to 60 feet long is no problem). 11 individual 15 ft outdoor pens and two 12' x 12' covered stalls. Picket Line available. Tent camping sites. Darling bungalow with heat, small kitchen and AC that sleeps 3-4 people. Unique privy and outdoor hot water Shower Bower. Interesting trails on site. Owners live next door. Extraordinary vacation or layover site! Location: 20 miles east of Austin, Tx off Hwy 71. Facilities: We have stalls or paddock available. Electrical hook up is available for your RV or trailer with living quarters. We also have a lighted arena and wash rack with hot water available. There is a 900 acre Cattail Marsh for trail riding. Location: Located inside Tyrrell Park, past the golf course. Minutes from restaurants, hotels, and a large RV park. If no answer at the barn, please call DeAnn Savell at 409 719-8154. Facilities: Overnight horse boarding, covered stalls, 100' x 200' covered arena, 30/50 amp RV hookups, roundpen, wash rack, hay & shavings available. 75' x 150' turnout, tractor trailer turnaround. Owners live on the property. Local recommended vet/farrier/feed stores/restaurant. Late arrivals are not a problem. $20.00 a night, cash or plastic. Multiple horse discounts. Fishing ponds on the property. Motels are ten minutes away. Wake up to fish flopping, horses grazing, and ducks swimming in a country quiet atmosphere. Location: Between Carthage and Marshall, 1\2 mile off US Hwy. 59 at the intersection of FM 1794 and CR 263. Facilities: 13 stall barn with lights, (each stall is 12’x12’ and has automatic waterers), 9 pipe and cable turn-outs (each with water and hay feeders), round pen, 100’x 200’ arena, 200 acres of pastures with riding trails, wash rack. Shavings and coastal hay are available for purchase. We offer a bedroom for people traveling through, $75 per night. Owners live on site. Go to our website for photos. Health certificates and negative Coggins are required. Location: 7 miles East of Bellville, Texas on SH 529. Facilities: Three bedroom barn apartment with 3 indoor (12' x 12') horse stalls and 3 outdoor stalls (12' x 48'). Daily continental breakfast. Full kitchen available. Hay provided. Maximum occupancy: 6-8 persons, 3-6 horses. Washer/dryer, satellite TV, large parking space for trailers. 800 acres for trail riding. Location: From I-35 in Belton,TX, take FM 436 east, travel 2 miles, turn right (southeast) on FM 1123, travel 4.5 miles, then turn left (east) on Campbell Hill Road. Travel 1 mile east to gate at 6942 Campbell Hill Road. Located 8 miles from Bell County Expo Center in Belton and 11 miles from Wildfire Ranch Arena in Salado, TX. Facilities: We have inside stalls, outside pens and stalls, paddocks, round pens, & arena. RV hookup & walker available also. We also offer local shuttle service to and from a hotel of your choice in the area if you want to leave your truck & trailer here at our gated facility. Propane refills, tire service, local mechanics, vets & farriers available & on call. Location: Located conveniently at the Rockhouse Road exit on the new William Crooker Bypass - only 3MIiles from I-20 & 1/4 mi from Hwy. Facilities: 12' x 12' stalls in a new barn with autowaters, rubber mats, and wooden walls. $25/night. Plenty of parking and room to turn. Turn out available, or your horse can exercise in our outdoor arena or cross country course. Overnight accomodations in a luxury guest house are available; 1 or 3 bedrooms. Location: 5 miles off 290 between Brenham and Burton. Halfway between Austin and Houston. Motel/restaurants in Brenham 7 miles away. 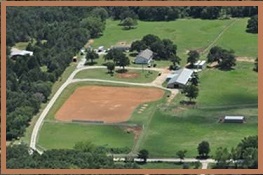 Facilities: 3 covered stalls, 65' round pen, large grass arena, 2 RV/trailer hook-up with electricity (50 amp) and water. Dump station on site, picnic tables, fire pit, gated entrance. Location: West of Waco and easy access to and from I-35. Facilities: We have 10 bunkhouses and 4 cabins. We have 111 covered stalls, 36 of which are inside of a world class arena. We have 62 trailer hookups including two 50 amp. (The rest are 30). Location: We are located just north of Fort Worth, Texas in Decatur. Decatur is home to more world champion rodeo athletes than anywhere else in the country! Even Stephenville! Facilities: 30 stall separate barn, many pens and turnouts. Ample parking, hook ups. Owners are horsemen that live onsite. Layovers or park here while you trail ride the area. Show arena. See web site for details & pictures. Location: 30 miles west of the Texas/Arkansas border and two hours from Dallas area or Gainesville. 1 mile from HWY 82. Facilities: 7 stalls, 3 with runs. Location: Approximately 90 miles east of Dallas, TX on I-30. Exit 134, go north approximately 6 miles, turn left on CR 3562, go 7/10ths of a mile. We are the first place on the right. Sulphur Springs, TX exits have several nice hotels around Exit 124. Facilities: Cedar Grove is a small, private facility offering 4 12' x 12' stalls and attached, lighted paddocks. 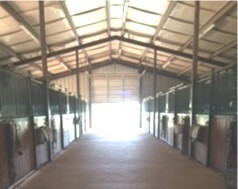 Paddocks and stalls can be used separately to accommodate more horses. There are two hookups for 50/30/20 amps, and each one can handle two rigs, and a separate 30 amp hookup. Water is available in pasture and barn. Parking is on pasture. Lighted arena/pasture, small lounge/tackroom, & bathroom (no shower). Coffee & hot chocolate (free) in lounge, water and drinks in the refrigerator. Another small frig and storage space in storage barn is available if requested. Light breakfast can be ordered in advance. Driveway can accommodate rigs up to 34 feet & longbed 4WD. Trees cleared to 13’ height in drive. Close proximity to Reimers Ranch, Pedernales State Park, Wimberley Rodeo Arena, and Dripping Springs Ranch Park (show arena). See web site for details & pictures. Location: We are located 3 miles from Hwy. 290 (see web site for specific driving instructions), about 4 miles from downtown Dripping Springs, 25 miles southwest of Austin, 7 miles from Dripping Springs Ranch Park, and 25 miles from Johnson City. See website regarding driving directions. Google maps will suggest roads that are not trailer accessible. If traveling on 281 from the north, take only Hwy 290. If traveling east (toward Austin), take only Creek Road or Roger Hanks Parkway. Do not take Hwy 165 or Holder Lane exits. Facilities: Indoor or outdoor overnight stalls, monthly rental stalls, round pen, arena, wash area, RV Hookups. Plenty of room for big rigs. Health papers and a negative Coggins test are required. Please call to cancel a reservation. Facilities: 5 padded stalls on a secure setting. A one bedroom guest house near the barn may be available for $100/night. Park your trailer for free (no hook ups). Several motels and restaurants nearby. Easy access and big rig friendly. Owners live on the premises. $20 per horse per night. Vets and feed stores are near by. Location: Between Fort Worth and Abilene. 5 miles off I-20. Facilities: Overnight horse motel, 30' x 50' outside stalls with shelter, pipe fencing with horse fencing to separate each stall. Large riding arena, large round pen. Cleaned daily. 110 electric hook up. Location: Easy access to I-10. Exit Artcraft from I-10, head southwest on Artcraft, proceed through the intersection. 2nd red light turn right on Westside Drive. Once on Westside pass first a farm on left, long stone wall. We are located at the 2nd farm on the left. Facilities: Outdoor pen with run-in shed. 2 10' x 20' stalls in barn. Round pen. $25/night We can accommodate your trailer or you can rent one of our two cabins for $100/night. One cabin has 2 bedrooms & 2 baths right by the barn. Horse stays free if you rent a cabin. Facilities: Our facility is located l/2 mile off Interstate 20 in West Fort Worth. Indoor arena, outdoor arena, located next to Park. 12' x 12' and 12' x 24' pre bedded stalls available. Wash rack, indoor paddock, turn out pens, turn out pasture, RV hook up. Our facility is safe and friendly and l/2 mile from motels, 15 minutes from Will Rogers. Location: Coming into Fort Worth on I-20 or 820 you will take Hwy. 377 (Granbury 429A) exit on the west side of town. Go north on 377 and our facility will be l/2 mile on the right side of the road. We are located next to Z Boez Park. 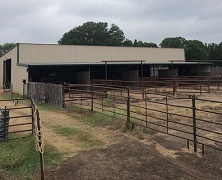 Facilities: Several stalls in a barn and outside pens. Safe, secure and fenced throughout. Barn has great lighting for late arrival. Trailer hookups available. Negative Coggins required. Kennel for pets. Location: North of San Antonio and west of Austin off of Hwy 290. Historical German town in the Texas Wine Country! 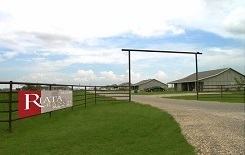 Facilities: 12' x 12' matted stalls, outdoor runs, round pen, indoor and outdoor wash racks, large riding track, trails. Driving distance to Dallas shopping, Ft Worth stock yards, Win Star Casino and entertainment. Limited RV hookups - electric only. Owners and caretaker reside on premises. Full care includes bedded stall, feed, hay, fresh water, sanitized stalls for $25 per horse per day. $25 per night RV hookup. Current Coggins and health papers required. Location: Southeast of Gainesville, Texas in the heart of horse country. Facilities: Great overnight facility. Easy trailer access for bumper pulls to big rigs. Overnight in your trailer OK or drop your rig and relax in a nearby motel. 35 Stalls, $35 per night includes use of 70 acre training facility. Covered arena. Outdoor dressage ring. Cross country efforts. Nice place to do schooling or pony club ratings. Can provide for layups or quarantine for overseas shipping. Location: Four miles south of Greenville, TX. Shops, hotels, restaurants, Walmart. Fuel. Four miles east of major truck stop. Easy access on and off interstate. Facilities: 10' x 12' stalls. Riding arena. 5 acre turn out. Separate lot for studs. Wash rack. Park trailer here. Full care $25.00 per night per horse. B&B for humans. $75.00 per room per night. Monthly horse boarding is available also. $400.00/month per horse. Includes quality feed, hay and pasture care. In case of bad weather all horses are hand walked into stalls. Hot and cold water wash racks indoor and out. Full access to all riding areas whenever needed. A 30 amp RV hook-up is available for $10.00 per night. Stadium jumps set in field for jumpers. I can teach beginner riders the English discipline through training level. Rates are $20.00/hr. if a student rides one of their own horses, $40.00/hr. to learn on one of my schoolmasters. Half price for half hour on both options. Serious riders only; must come equipped with helmet and gear. Anyone under the age of 18 must be supervised by a trainer or parent. Location: Off of Hwy. 30. Greenville, Tx. 4511 South Houston Street. Greenville, TX 75401. Call for exact directions. 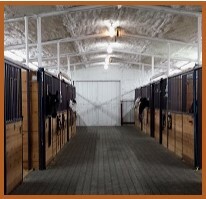 Facilities: Barn with 3 12' by 12' stalls, an arena, and 2 holding pins. We have 2 water and electricity hook ups with 50 amp breakers. We also have room accommodations on the property; a cabin that sleeps 10 guests. Luxury motorhome sleeps 4. We have a farrier station and farrier on the property. Location: Four miles north of Huntsville and convenient to I-45. Facilities: Shed-row barn with 9 - 12' x 12' and 1 10' x 12' pipe stalls; round pen; stocks; limited trailer hook ups, well lit and gated. Dogs must be leashed. Motel and restaurant 1/2 mile from facility. Current coggins and health certificate required. Reservations only. Owner on site. Location: Convenient to Interstate 10. Facilities: Golden Curls Ranch offers 12' x 14' stalls with fresh shavings, indoor wash stall, dressage arena, round pen, 40 acres of trail riding and pasture for grazing. We have both inside stalls and outside grazing pastures. We have 220v hook ups for horse trailers. Location: Golden Curls Ranch is approximately 14 miles from I-20 and I-45. We are approximately 30 miles from downtown Dallas which connects to I-30W and I-35 N. We are also located approximately 20 miles from the Mesquite Rodeo in Mesquite, TX. Facilities: 50 box stalls available for overnight boarding, covered arena, horse exerciser, round pen, trailer parking, 12 trailer hook ups. Location: Conveniently located between I-20 (Terrell) and 175. 30 miles east of Dallas. Facilities: We offer a 5 stall barn complete with Priefert Stalls. We have 2 round pens and 1 arena for our clients' use. We offer RV hookups if needed. Coastal Hay is available for purchase. We will always accept stallions. We accept credit cards, checks and cash for payment. We have LaQuinta, Comfort Suites and Hampton Inn within 3 miles of our farm. Location: Conveniently located 3 miles off I-20 at Exit 557. Exit I-20 at exit #557, Jim Hogg Road, go north on Jim Hogg Road, CR 431, travel 2.4 miles to CR 499. Turn right on CR 499, travel 1 mile to CR 498. Turn left on CR 498. Travel 0.4 miles to CR 4102. Turn right on CR 4102, travel 1.3 miles, turn left at Casa Cassel II sign on your left. Facilities: Easy access for big rigs to covered stalls with fresh water at JLK Event Center ( adjacent to our B & B) per availability. Stall rates are $25 per horse and current Coggins certificate is required. 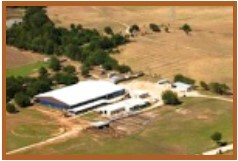 Contact http://www.llanoeventscenter.com/ if interested in using their arena. We have an old three bedroom German farmhouse decorated in Texas/Cowboy style with queen-size beds. It includes a washer, dryer, dishwasher and full kitchen. We serve a tasty continental style breakfast or offer rooms without breakfast upon request. Location: Located on West RR 152, just 1.75 miles from downtown Llano, TX. (courthouse on Hwy. 16 intersection). We are in a rural area with close access to town. Facilities: World class barn, fourteen 12' x 12' stalls with dirt floors and swing out feed doors, wash rack, farrier station, veterinary stocks, 7 covered, 11' x 30' runs, 180' x 80' turnout pen, 4-horse hot walker, 60ft. 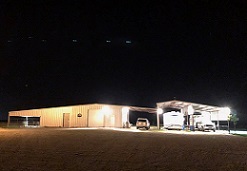 lighted round pen, 280' x 180' lighted roping arena. Plenty of trailer parking and easy access for 'Big Rigs'. Full care available. Multiple horse discount (4 or more). Shavings available for an additional fee. Short and long term rates available. Must have current coggins and current health certificate if coming in from out of state. We also offer a fully furnished two bedroom apartment that sleeps 5. It includes a washer, dryer, dishwasher and full kitchen. Short and long term rates available. On-Site manager. Location: We are 3/4 mile past FM179 on 50th Street on the west side of Lubbock. Facilities: 12' x 12', 12' x 15' stalls - all very nice; covered and enclosed. Horse walker. New and very clean facility. 70 site RV park with 30 and 50 amp hookups, laundry, swimming pool, showers, kitchen, pond, and river access. Easy access for big rigs. 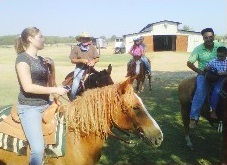 $25.00 per horse, $30.00 per rig (up to 2 people), additional fee for over 2. No stallions please. Our riding area is a working training center and, as such, we do not allow outside riders due to the fact that this is a training facility. On call mobile vet available. Facilities: 4 covered stalls (2 with turnouts), 4 pastures, lighted arena, hookups. Fresh bedding and hay available for purchase. Location: 25 miles west of Houston. Facilities: One(1) bedroom barn apartment with queen and bunk beds with full kitchen. Continental breakfast or breakfast materials to fix your own, direct TV and free WI-FI, $75 per night, maximum of 4 people. Four(4) indoor (12' x 12') Priefert horse stalls, $20, and two (2)outdoor covered Priefert horse stalls surrounded by a large grassy turnout, $20. Hookup for 2 Living Quarter trailers, $20 includes water and electricity. Fifty (50) foot round pen and stock, indoor wash bay, organic fly spray system. Hay and grain extra charge. Coggins and health papers required. Dogs must be on leash. Owners live on premises, rural setting, quiet, well lit and gated. Location: .Approximately 33.8 miles east of Mt. Pleasant, Texas. Exit I-30 at Exit #178 (U.S.259), south 3.9 miles to Texas Hwy. 77. Turn East (left) go 12.6 miles to Texas Hwy. 250. Turn right, 1 mile to Stevens Drive, turn right, 5th house on right. OR from Texarkana, Texas and Interstate 30, turn South onto US 59 to 7th Street (US 67), turn right (WEST), go to Maud, turn left (SOUTH) onto Hwy. 8, go to Douglasville, turn right (WEST) on Hwy. 77, go 10 mile to FM 250, turn left for 1 mile to Stevens Dr., 5th house on the right. Facilities: Cibolo Creek Cabin Barn is a private barn on 63 acres of wooded land with a beautiful creek running through it. There is plenty of room for your horses after long hours in the trailer. Just 5 miles off of IH 10 with plenty of trailer maneuvering space, it is an easy option for many traveling horse owners. Choose from inside stalls with runs or tree shaded outside pens (20' x 20' square pen and 50 foot round pen). You can also set up your own pens along side your rig in a nice grassy area if you like. An RV hookup is available, as well. We have one water and electricity hook up but no sewage dump. We have a quaint, remodeled cabin nestled in the trees along the Cibolo Creek available to rent if you would like to stay close to your horses in comfort. There are many trails to hike or ride along the creek. Also, we are just 35 minutes from downtown San Antonio if you have time to take in the lovely town known for its beautiful River Walk. Location: 5 miles south of IH 10 between San Antonio and Seguin. Facilities: Facilities include *** Round pen on grass; $25 *** 12' x 14' prefiert box stalls on concrete with rubber matts (bring your own shavings); $30 *** Stall with a turnout run; $40 *** 30 amp hookup; $30 per night *** Modern motel room with pillow top mattress, satellite TV; $75 per night. Late arrivals after 9 p.m.; $15 *** CASH ONLY *** Coggins and health papers required. Location: JJ’s Barn is located off I-20 on the far East side of Texas and is about 35 minutes from Shreveport, LA. This facility is family owned and operated, gated, and is very quiet. 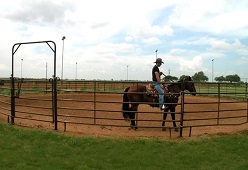 Facilities: 12' x 12' stalls, turn out pasture, indoor and outdoor arenas. Location: 5 miles north of Hwy. 20, Millsap exit off Hwy. 113. We're located 42 miles west of Will Rogers. 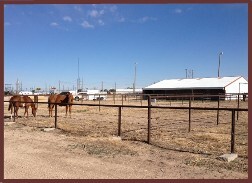 Facilities: Full RV hook-ups(water, sewage, electric), 12' x 12' stalls (lights, water, fans), turnouts, roping arena (lights). Please call and make a reservation. If for some reason I don't answer I will call you back. The number listed is my cell so you can text as well. Location: Brock exit off of I-20, one exit past Teskeys and only 8 miles off the interstate. Very easy to find. Facilities: We offer covered stalls for over night guests. Included is use of a covered arena, a walker, and our round pen. 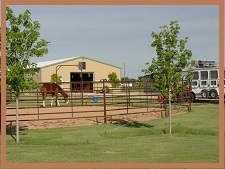 West Texas Horse Center has been located in Odessa since the year 1990. Let us put our experience to work for you. Location: Located at exit 108 on I-20, 7 Miles West of Odessa. 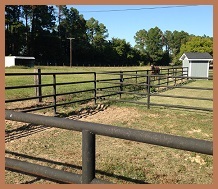 Facilities: We have a few outdoor pens, water/electric (1) - hookup $25.00 per day, $25.00 per horse. You are welcome to use generators. We are safe and quiet with fencing and we keep our gates locked. Large trailer circle driveway. Owners on live on the premises and you must show negative Coggins and proof of vaccines. Location: We're 12 miles off highway155 and 20 miles north of the town of Palestine. 30 minutes from the southside of Tyler. 1 hour, 47 minutes to east Dallas, 2 hours, 18 minutes from Shreveport, LA, 2 hours, 45 min from Houston. 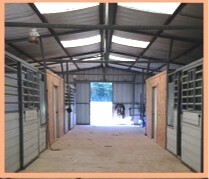 Facilities: Ten - 12' x 12' indoor stalls. We provide shavings for stalls, coastal hay and alfalfa available upon request. Local Vet and feed stores are near our facility. Completely fenced and gated for security. Owners live on site. Health Certificates and Negative Coggins must accompany each horse. $25.00/horse Cash or credit card - "No Checks." 24 hour advance notice. Location: Located between I-35 and US Route 75, seven miles off of Hwy. 380 in Pilot Point, Texas. Horse Country USA. Facilities: Easy access, simply 2 miles from Hwy 287 on paved road. Have been in the horse hotel business for 6 years. References available. Privacy and anonymity guaranteed. 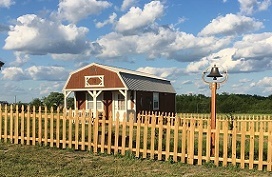 Brand new barn with shed row for your horse’s comfort, especially in the hot Texas summers. The safety of your horse is my first priority. I have also housed emus, show cattle, and can offer facilities for just about any animal you may be hauling. Free Internet. Beautiful sunset and sunrise! Stalls are $15 if you clean, $20 if I clean. Top quality coastal and alfalfa available for purchase as well. 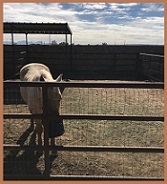 Facilities: Windy Mane Ranch is proud to provide clean and affordable self-care (only) facilities for our clients. 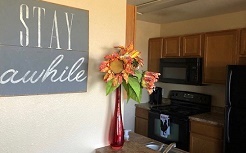 We offer on-site property management, an efficiency apartment, and plenty of parking for your large horse trailers. We have 3 turn-out paddocks, and up to 6 stalls. The stalls are 12' x 10'. Some of them can be doubled (24' x 10') if you need more room. Closed circuit cameras are used to ensure security of the premises. Dogs are welcome but please keep them on a leash. Location: Windy Mane Ranch is located 19 miles north of Fort Worth in Roanoke, Texas, the "Unique Dining Capital of Texas." It is convenient to several choice equestrian venues, including the Will Rogers Memorial Center. Facilities: Facilities: Our facility is located off of Interstate Highway 35 in Sanger, Texas. Lighted, all weather covered arena with enclosed 2nd floor observation deck. 24-12' x 12' pre-bedded stalls available. Insulated barn. Grain and hay available to buy. Wash rack, turn out pens, turn out pasture, RV hook up, and a small guest house near the barn. Men's and women's restrooms and showers available at the arena. Access to riding trails and also a driving course if you pull carriages. Plenty of parking for horse trailers. Feed store, hotels and restaurants nearby. We live on the property and manage it ourselves. Facility is fenced and gated. We take pride in our facility and have our own horses on the property so current Coggins is required for the safety of everyone. Location: Between Denton and Gainesville Texas, just off of Interstate Highway 35. Easy on and off access from highway. Call us for specific directions or check us out on our website for more information. Location: Located near Cottonwood, Texas. Our mailing address is Scurry, Texas. Facilities: 12' x 1'2 Stalls, turn outs, lighted arena, lighted round pen. Close to town, easy access just off the Hobbs Highway. Facilities: Box stalls with runs available. Larger pen with shed available. Turnout area available for exercise. Large outdoor arena and small covered riding area. Room to park your trailer, easy turn around circle drive. Not far off of the highway. Location: Just 30 minutes from Ft. Worth, between Weatherford and Decatur, Texas. Facilities: 100' x 200' pipe and cable lot. Lot has a 12' x 24' lean-to in it. $25 per night for the first horse. $10 per night for additional horses. Maximum of 3 horses total in the lot. Automatic water in pen. RV hook up with electric and water; $25 per night. No sewer. Nice big gravel drive to turn around and park. Arena available to ride in. The lot for 3 horses and RV hook up is available for a monthly rate of $425 as well. Current health papers and a negative coggins required for all horses entering the grounds. Location: Southeast of Stephenville and within easy access to Route 67. 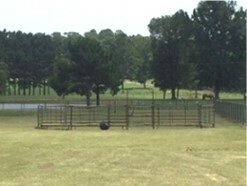 Facilities: 5 covered stalls and 8 corrals (33' x 120') all with water. Convenient access. 24/7 check-in - cash or major credit cards. You can rent a corral only, RV space only, or both. Dump station available. No matter if you are on the show circuit, rodeo trail, or going for a trail ride or hunting, we have a spot for your horses. Location: Star of Texas is located on the south side of Stratford, Texas, on US Highway 287 and five blocks south of US Highway 54. We are the halfway point between Denver and Ft. Worth. 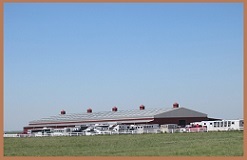 Facilities: Nine large, covered stalls, covered pens, and open corrals. We have a round pen, wash area, and a covered RV hookup. Hay is available as are riding trails, cabin rental, and trailer parking. No hookup. Our facility is quiet and secure. Location: Midway between Dallas and Shreveport, Easy access from I-20, Exit 562 (Tyler State Park Exit), 2 miles north of I-20 on FM14. 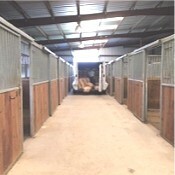 Facilities: Stalls, turn out, indoor and outdoor riding arenas. Hook ups for trailers including electric and water. 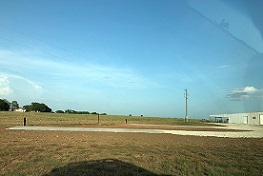 The ranch is easy to get into and out of and is close to I- 35. Facilities: 6 horse hot walker available, 150' x 120' covered arena. Enclosed, insulated barn with 10' x 12' stall w/mats, shavings. Barn has heating if needed, fans, insect spray system. Additional outside covered stalls are also available. Stall prices are $35 per day. 2 wash racks, outside and covered. Mechanical cow and hydra. bull. Sleeping accommodations are available for $85 a night. Bunkhouse with heating and A/C. It has 3 bedrooms, sleeps 5, 2 full baths, kitchen and living area, washer & dryer. Also available is an apartment loft, living area. It sleeps 5 and has a kitchen, full bath, heat and A/C. Coastal hay available if needed. We are a lay over station, too. Plenty of parking for rigs with lots of room to turn the rigs around. Electric hookups with water are available for $25 day. Health certificate or negative coggins required. We are 1 mile from town, fuel, restaurant and motel , and feed store if needed. Farrier and vet available. Location: If coming on Hwy. 20 east take exit 540, Van & Edom. At the stop sign turn right, next immediate right is 1995. 3rd driveway on left 3120 FM 1995, Circle Bar H Ranch & Arena. If you're coming from Hwy 20 west take exit 540, Van & Edom. At the stop sign turn left, go over the freeway through the stop sign, go 1/2 mile and turn right on 1995 , 3rd driveway on your left. 3120 FM 1995. Circle Bar H Ranch & Arena. Facilities: 12' x 12' stalls with rubber mats and bedding or outdoor grazing paddocks of various sizes with shelter and pipe fencing available. Stalls have fans and auto water, safe and secure. Exercise area for your use. $25 cash per horse per night. Electrical hookup $10 per night. Good lighting and space for big rigs. Very easy access from I-20 and only 3 miles from town. Current health papers and Coggins test required. Location: EASY ACCESS. 45 minutes from Dallas and 30 minutes from Tyler. From I-20 West, exit 537 and cross over Highway 16 on service road. Take the next right, FM 773. Follow 773 for 1.5 miles to the north and look on the left for a single level gray brick home, gray barn, and black pipe fence before the curve to the right. From I-20 East, exit 536 and turn left on FM 773. Follow 773 for 1.5 miles and look for same gray brick home, barn, and pipe fence before the curve to the right." I am located 7 miles from 4T Feed and Tack. Facilities: Layover boarding, lay-ups, fitting & conditioning, rehab and therapy services, RV hookups (electric only, shower available). paddocks, covered arena, chiropractic & massage services for humans and animals, swim lane and hot/cold spa. Location: North of Hwy. 82 West of Hwy 377. 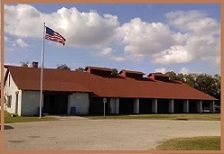 Facilities: Located in the heart of horse country, north of US Hwy. 82, between I-35 and I-75, 20 miles east of Gainesville and 14 miles west of Whitesboro. 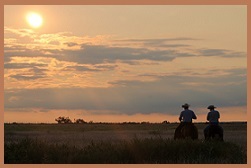 We are a convenient stopping point for horse haulers traveling through North Texas. 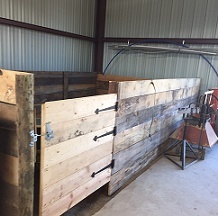 Layovers include 12' x 12' or 12' x 24' solid wall box stalls with fans, straw bedding, grass hay and water. 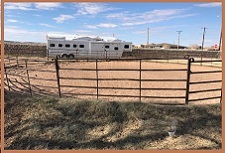 Room for up to 18 horses, indoor warm water wash rack, 2 round pens, loading chute, RV hook up, trailer parking, easy in & out access for large rigs and air conditioned bunkhouse that sleeps up to 6 guests with satellite TV, free wifi, full kitchen, patio, BBQ grill and shared barn bathroom with shower and laundry. 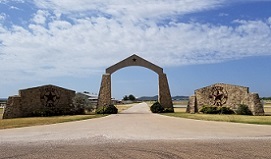 Sorenson Ranch Texas, Inc. is owned and operated by Danny and Kimberly Sorenson who also reside on the property. Danny is a journeyman thoroughbred jockey for over 32 years and spent most of his racing career in Southern California. Kimberly has worked as a sales account manager in the animal health industry for over 20 years and prior to that worked at the track and farm exercising thoroughbred race horses. 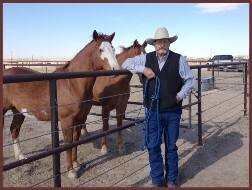 We strive to offer a safe and comfortable environment for both the horse and hauler. Please call for directions. Location: 20 miles east of Gainesville, TX and 14 miles west of Whitesboro, TX off US-82. Please call for directions. Our new Bed & Breakfast facility is open and ready for future guests. Facilities: Legacy Park Equestrian Center (formally Cruse Acres), Wichita Falls premier 200 acre equine facility, is located in Wichita Falls proper at the South Interchange of U.S. 287/281 (Windthorst exit) and just minutes away from the J. S. Bridwell Agriculture Center, lodging, dining, fuel, and trailer services. 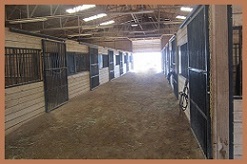 We offer spacious new (12’ x 24’) stalls with fresh coastal hay included @ $30.00 per equine. 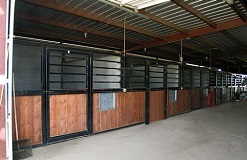 Outdoor pipe turnouts & shed rows are also available along with dedicated stallion stalls. Immediate expressway access & city-country location make Legacy Park the equine destination for overnight boarding in the North Texas Area. Big rig access with RV hookup available. Vet on call. Security is provided by Sam & Laurie Cruse who reside on the property along with a “state of the art” camera surveillance system. Under construction & coming 2010, “The Bunkhouse”, a 500 sq. ft. guest room. Location: Overhead Expressway@U.S.287/281 (South) Interchange - Take Windthorst or Midwestern Parkway exit. 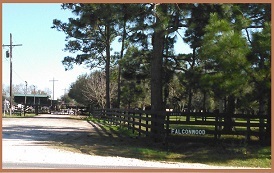 Facilities: Falconwood is located in Winnie Tx, 30 minutes west of Beaumont and 1 hour east of Houston on IH-10 East. Stalls are $25.00 per horse per night and includes shavings, and fresh water in stalls. We have a covered arena with lights and a washrack with hot water! Cross country course on 50 acres. A simple efficiency apartment may be available, or hotels at exit 829. 30 amp hookups are available for RVs, We welcome arrival anytime between 6 a.m. and 12 midnight! Super easy access as we are facing interstate 10! Plenty of turnaround room for large trailers! Current Coggins is required. Veterinarian on premises! Call to reserve 409-656-3822. Location: From Houston: Take I-10 East to exit #829 - Winnie (Hwy. 1663). Exit and stay on feeder (access road) past 4 Way-Stop sign. Stay on feeder past the motel and Chinese restaurant and go approximately 0.7 miles, turn in when you see Winnie Veterinary Clinic on the right. Call (409) 656-3822 at Falconwood gate. From Beaumont: Take I-10 West to exit #829 – Winnie (Galverston, Hwy. 73, Hwy. 124, Hwy. 1663). Exit then make a U-Turn under I-10. Stay on the feeder (access road) past the Quality Inn and go approximately 0.7 miles, turn in when you see Winnie Veterinary Clinic on the right. Call (409)656-3822 at Falconwood gate.